Product prices and availability are accurate as of 2019-04-18 13:23:33 UTC and are subject to change. Any price and availability information displayed on http://www.amazon.com/ at the time of purchase will apply to the purchase of this product. The Double Standard Softener produces twice the gallons compared to the standard model and is the largest compact RV softener on the market. Built for the owner of any RV/Marine model, this 16,000 grain unit is a perfect fit and supplies approx. 40% more soft water than any other unit on the market. It simply regenerates with 2 boxes of common table salt in less than 30 minutes and provides the owner with soft water up to 1600 gallons or up to 40 days. How many gallons the unit will make depends on the hardness of your water source. Its compact, space-saver design allows it to be installed in the tightest places. Its unique features includes easy to carry handle on top, large mouth opening for easy salt addition, high grade premium resin, 360 degree swivel for easy connection of the inlet hose, travel friendly option of cap & plug to prevent leakage and is built for quick & simple regeneration. It utilizes a standard hose connection between park faucet and your RV/Marine, requires NO tools or electricity and its compact design 22"H x 9.50"dia. can be easily stored in your storage bay or dock side locker. It will allow high flow rates with very low pressure drop. The softener provides soft water that prevents hard water & rust stains, avoids scale build-up, improves taste and odor, increases lifespan of appliances and will also improve rough dry skin while increasing lathering of soaps. The inlet high-flow shut-off control valve will allow a very slow rinse resulting in improved water quality and greater capacity and is also designed with a 360 degree swivel for easy connection of inlet hose and travel friendly option of cap & plug to prevent leakage. Back-flush adapter is included for quick reverse connection when required. 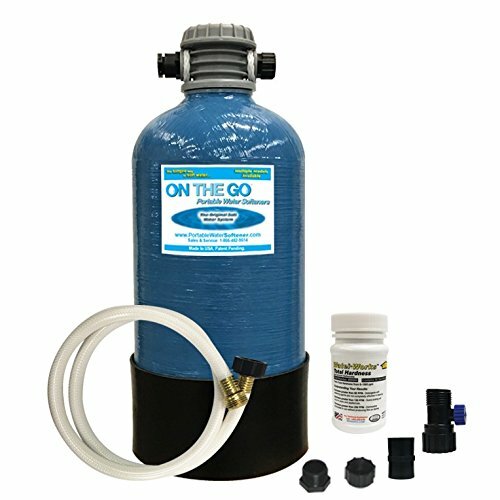 Unique, patent-pending design includes hardness test strips, storage inlet/outlet caps, handle, inlet hi-flow shut off valve, back-flush adapter, high pressure 4' white drinking hose and a full cradle base for a very secure & stable setting. The Double Standard Softener & Conditioner produces twice the gallons compared to the standard model and is the largest compact RV softener on the market. Built for the owner of any RV/Marine model, this 16,000 grain unit is a perfect fit and supplies approx. 40% more soft water than any other unit on the market. It simply regenerates with 2 boxes of common table salt in less than 30 minutes and provides the owner with soft water up to 1600 gallons or up to 40 days. Its compact, space-saver design allows it to be installed in the tightest places. It will allow high flow rates with very low pressure drop. Its unique features includes easy to carry handle on top, large mouth opening for easy salt addition, high grade premium resin, 360 degree swivel for easy connection of the inlet hose, travel friendly option of cap & plug to prevent leakage and is built for quick & simple regeneration. It utilizes a standard garden hose connection between park faucet and your RV/Marine, requires NO tools or electricity and its compact design 22"H x 9.50"dia. can be easily stored in your storage bay or dock side locker.